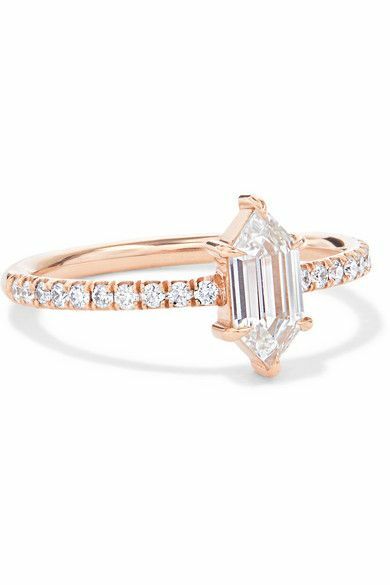 There are a lot of engagement rings out there, including ones that fall within the “unconventional” realm. From alternative gemstones and unique settings, it can be tough to narrow down which ones feel true to you and your sense of style. Though there’s always the option to go as nontraditional as possible, there’s also an unexpected style that feels both modern and timeless: hexagon engagement rings. With a cool geometric shape that provides a contemporary response to traditional gemstones found in engagement rings, a hexagon stone will feel special to you without the risk of feeling dated years after your walk down the aisle. Plus, if you do decide you want something more eye-catching, there are a handful of options that take the idea to another level. Considering those two factors, there’s no doubt you’re about to see this style everywhere. The eternity band on this makes this ring so eye-catching. Style this with a curved band for a cool stacked look. We can’t get over the dreamy shade of this sapphire. Now this is not your average engagement-ring setting. A cluster like this—along with the unconventional sapphire stone—is so unique and unexpected. Simply put, a modern classic. 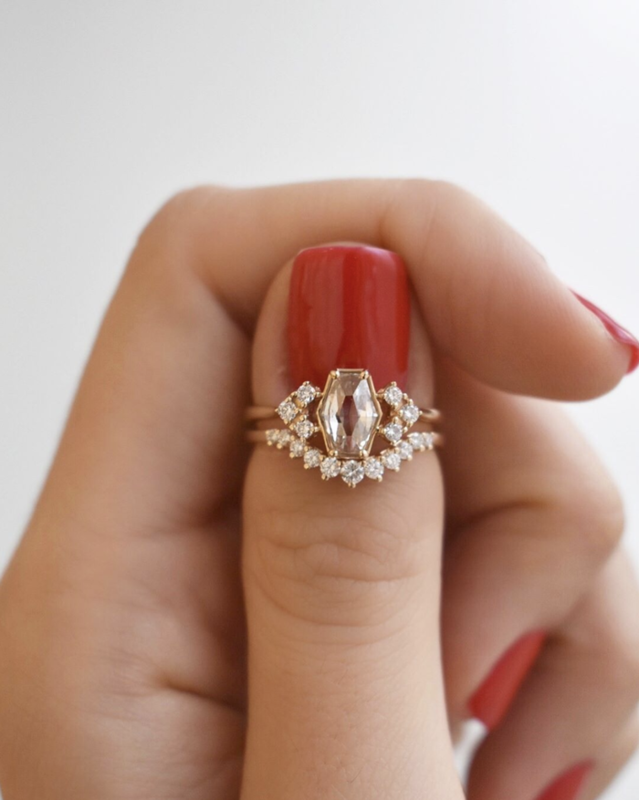 You won’t get tired of looking at this chic ring. A double band will give you an instant ring stack. A delicate halo around the center stone gives your ring an extra sparkle. Such an unexpected take on the halo trend. We love the offset style of this particular ring. This gorgeous ring will catch anyone’s attention. This delicate ring was made with the minimalist bride in mind. What’s better than one hexagon? Three, of course! Made for the modern bride. Need a band to go with your engagement ring? Read this expert’s tips on finding your perfect wedding band.